In Magento 2, there are many ways that can cause the product quantity change but default Magento 2 does not keep tracking of inventory adjustment. There is no tool that can help admins follow the stock of whole products, they must go to the product edit page of each item to check the current quantity. Hence, it will be so convenient for store owners if having a feature that helps them know how and when the product stock was changed. Inventory Report for Magento 2 extension is a simple but very useful tool that allows admins to follow all the changes of product quantity. Check out other tools: Magento 2 Admin Action Log extension, Magento 2 Admin Email Notification extension, and Magento 2 Admin Product Preview Plus extension which also support admin activities in the backend. All information about the inventory movements is recorded and displayed in a grid. Admins are able to know what product quantity is changed, when and why it is modified. Product name and SKU are linked to product edit page. Therefore, admins can go to the product edit page and view the retailed inventory report of an individual product. Besides, admin can also quickly view order details page and credit memo details page by clicking on the View Order or View Memo in the Action column. Both actions from the frontend and the backend making stock change will be tracked, including: create orders from both the backend and frontend, delete orders, create credit memos, import products and change quantity in the product edit page. Inventory Report for Magento 2 extension also tracks the history of stock adjustment for each product. Why Inventory Report for Magento 2 is your must-have extension? 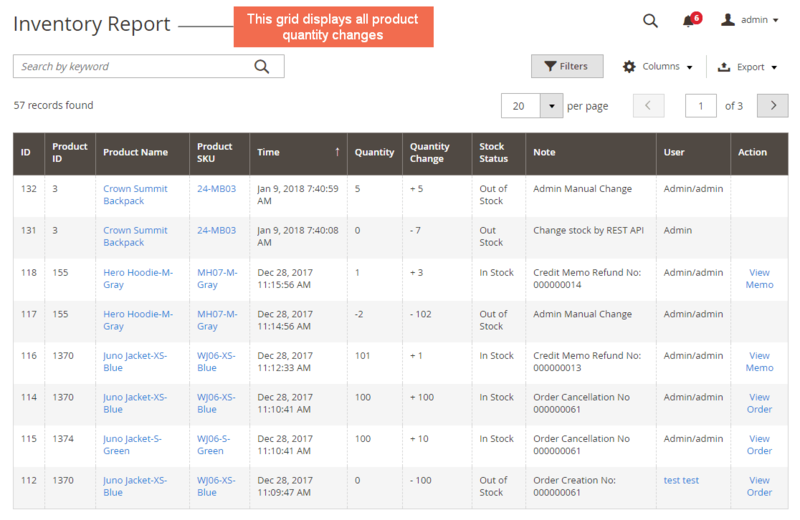 Magento 2 Inventory Report extension gives you a useful tool to keep a clear count of stock items in your store. You can see whether products in your store are going out or going up without navigating to product edit page of each product. Using this information, you can adjust your product quantity accordingly. In order to make sure that products in your store are always ready to sell, you should know what items are running out of stock and when you need to order or make more supply of these items. Managing your product inventory is a key part of controlling costs and keeping customers happy by having popular items in stock. This extension is very helpful in managing product stock. I just had to install the module then it does everything. I do recommend this extension! I couldn't follow and remember all the movement of product quantity because my website has too many products. I've found an extension like this for a long time. Luckily, I found out your store and get this. Thanks a lot!